Getting your CPA license in Illinois doesn’t have to be a hassle if you’re well prepared. Here’s what you need to know prior to securing your certified public accountant licensure. Before you’re allowed to sit for your CPA exam, Illinois regulation requires candidates to have completed a bachelor’s degree or above, as well as 150 credit hours from an accredited university or institution. If you’ve not yet met all of these requirements but you’re in the process of completing your education, you may be able to obtain provisional approval to sit for the exam. If granted, you’ll have 120 days from the time you take your exam to submit your final college transcripts. Students who attended a university outside of the United States will need to submit their credentials for verification to the National Association of Boards of Accountancy (NASBA). Be careful not to leave out any information about the colleges or institutions you’ve attended. You’ll be able to pay the $200 application fee online with a credit card upon applying. Foreign applications are free of charge if all credits were earned out of the United States. Submit your final transcripts to the ILBOE upon completion of all the education prerequisites. Original copies can be sent by mail to Illinois Board of Examiners, 1120 E. Diehl Rd, Suite 110, Naperville, IL 60563. You can also email transcripts to etranscripts@ilboe.org. Go to the ILBOE online system to complete the Initial Examination Request. Expect to be charged a fee ranging from $40 to $120 (depending on how many exam sections you’re looking to schedule). Sit back and wait for a letter of approval from the ILBOE to arrive. If you haven’t paid your fee yet, you’ll receive a payment coupon that will be good for 90 days. If not paid by then, you’ll have to reapply. Once all fees are paid, you’ll receive a Notice to Schedule (NTS). You must schedule an exam appointment within six months. You can now go ahead and schedule your exam through Prometric’s website. Contact the ILBOE or consult their website for information regarding scheduling details. Be sure to sufficiently study, and complete your exam at the scheduled time. You can expect to receive your score within one to two weeks. CPA candidates must complete a class on professional ethics offered by the AICPA, followed by an open book exam on which you must score a 90 percent or higher. AICPA will send your results to the ILBOE upon request. Once you’ve completed these steps, you’ll receive a certification of CPA Exam Completion as well as a certification from the ILBOE as a CPA. However, this doesn’t mean that you’re licensed to start practicing on your own. After completing the education and exam steps, you’ll need to get some experience under your belt before you’re able to become a licensed CPA. These are the steps you’ll need to take to move forward with your licensure. On the Verification of Employment/Experience form located in the Application for CPA Licensure paperwork, document your completed work experience. This will need to be signed by your supervisor. After you’ve finished your year of supervised CPA employment, you’ll be eligible to apply for your CPA license. On the Illinois Department of Financial and Professional Regulation (IDFPR) website, locate and download the application packet. Submit the application along with any supplemental information (including experience verification) and required fees to Illinois Department of Financial and Professional Regulation, ATTN: Division of Professional Regulation, P.O. Box 7007, Springfield, IL 62791. 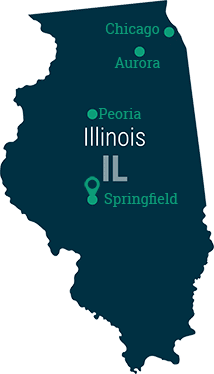 Once you’ve received your Illinois CPA license, you’ll need to routinely brush up on your skills to make sure you’re up to date on current regulations and information. Every three years, the state of Illinois requires CPAs to complete 120 hours of continued professional education (CPE), four of which must pertain to ethics. For your first license renewal, you’ll be exempt from the CPE requirement, but be prepared to take future classes to keep your skills sharp. To find CPE courses, consult the Illinois CPA Society or the NASBA registry. You may also consider joining a professional group to make sure you’re on top of current news and regulations. The Illinois CPA Society is a great local choice, as is the American Institute of CPAs (a nationally based group).